A powder room may be the smallest place in your home. For many, it’s a simple and functional space that gets left behind. It gets only the barest of styling and decorating. The powder room is worth considering because it’s often a space that your guests use. By giving some consideration to the modest powder room, you can change your home for the better. If you have a dated and unattractive powder room or guest bathroom then we have some great tips for you to revamp its style. This underestimated room can really surprise you if you style it right. Join us and get inspired! You might be thinking that the powder room doesn’t need a style and it can just be bathroom themed. We think that you have to start here. Reimagine the powder room and choose a style that will guide you throughout the process. Confused about where to start? 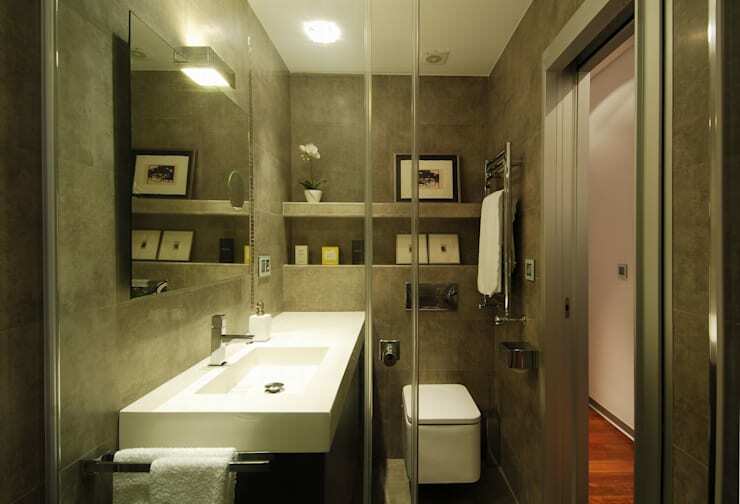 Take a look through the bathroom inspiration on homify. We suggest picking a few materials, colours, and products that speak to you. You can even create a mood or inspiration board to help you nail down your ideas. Mood boards are great for finding inspiration for every room of the house! This tiny bathroom is big on style. The concrete look gives the space an industrial feel. We love the wide and bare countertop and the built in shelves. Perfect for a little sliver of a bathroom. Since the powder room is a small part of your home, it’s a great place to experiment with colour and style. There are endless colour possibilities for powder rooms. Light colours look great because they can reflect light and make a small space appear larger. If you think white is too clinical or boring, then you can pick another light neutral like greige. A quick paint job is the easiest way to give the powder room a fresh look. Style your powder room with bold coloured accessories and to try experimenting with colour. 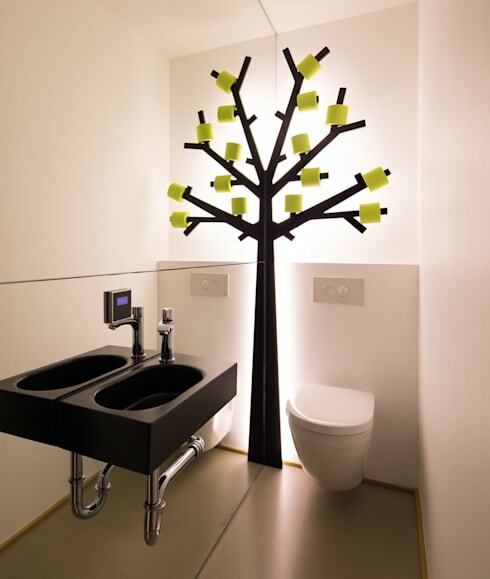 This powder room has a tree sculpture that doubles as toilet paper roll storage. So quirky! Don’t be afraid to get a little cheeky in your powder room design. 3. Don’t forget about the floor! The powder room has a small footprint in your home! The floor you choose will be an important design feature in the overall look because of the small space. This powder room features a floor that blends seamlessly with the smooth plastered walls. The room appears more spacious and bright. Tiled floors are great options for their style and versatility. They can add a glossy sheen to a room. Matte floor tiles offer sophistication. Patterned tiles can bring some fun and colour to the powder room, too. Besides tile, laminate and wood are good options that will give the room a warm atmosphere in an instant. homify knows professionals who can help you get the best floors in your home. A powder room might not be where you get ready each morning, but they still need some storage space. Since powder rooms are so small it’s difficult to create enough storage for them. We are always aiming for a bathroom space to be clear and uncluttered. This powder room has recessed shelves for some decor items. Shelves like this are great for storing rolled up towels or storage baskets. 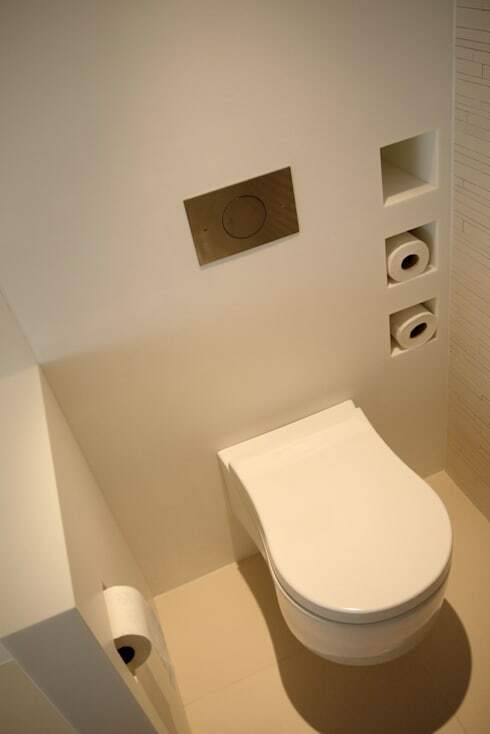 Other solutions for storage are cabinets and over the toilet storage units. Underneath the sink is perfect for extra cabinet space. 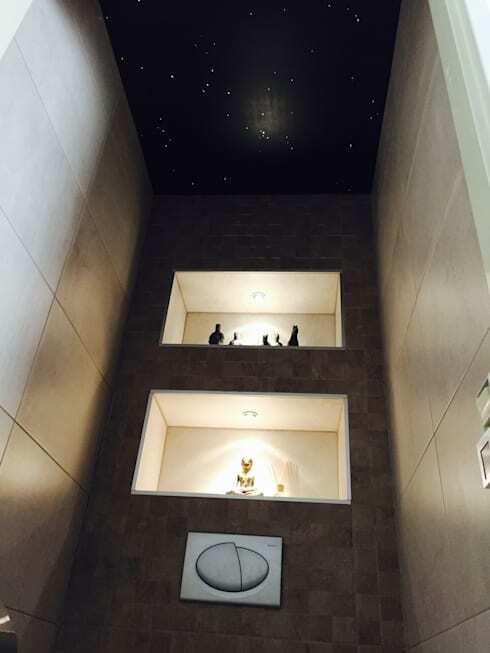 In this powder room, the lighting solutions also save space. Wall sconces and heavy light fixtures can fill up a small powder room. Aim for built in LED lighting like this to reduce the visual clutter in the room. Once the foundation has been laid, it's time to decorate with accessories. Textiles are a perfect way to give your powder room more atmosphere. In this powder room, a bathmat looks great surrounded by the modern fixtures and a sleek tile floor. The room has a neutral palette, so the red colour accents give the space a bold and fresh look. Bathmats in neutral tones add depth and comfort to a room without making a statement. There are mats made of bamboo, pebbles, and wood if you want to bring natural elements to the powder room. 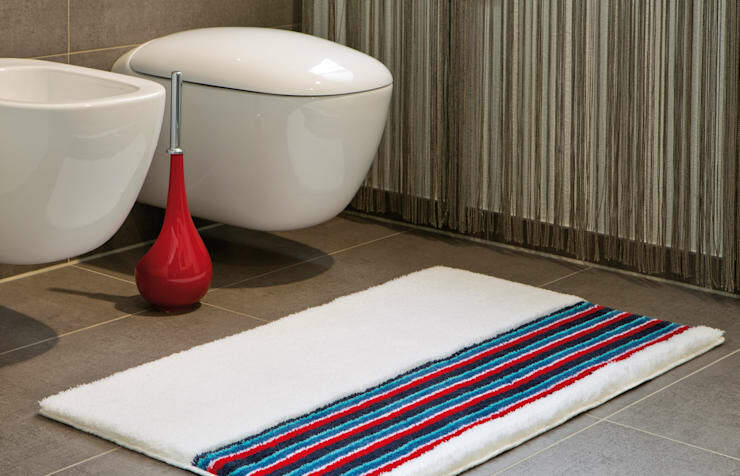 We like bath mats that are stylish yet easy to clean! Each room needs a finishing touch, and the powder room is no different. Accessories make a space look put together. Just make sure to use a light touch because it’s easy to clutter up a small space fast. This powder room has an open cabinet housing crisp white guest towels and an exotic wood box. Practical storage solutions like boxes and baskets can be stylish and functional! It’s an easy way to tuck away hygeine products while keeping them handy. 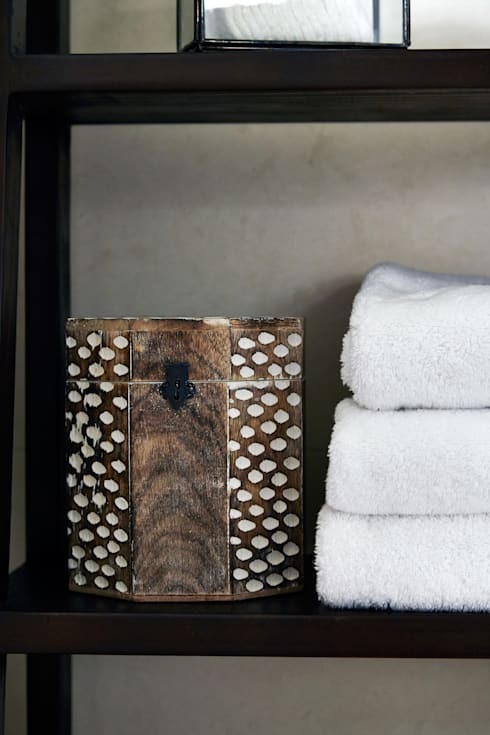 Curate your powder room with an item or two to go with the style you’ve created. Remember the powder room is frequented by guests in your home so choose pieces you want to show off! When all your powder room elements come together they will create a harmonious whole. At each step take care to consider how an element will look next to the others that you’ve selected. This powder room has cohesive style that’s bold and artful. 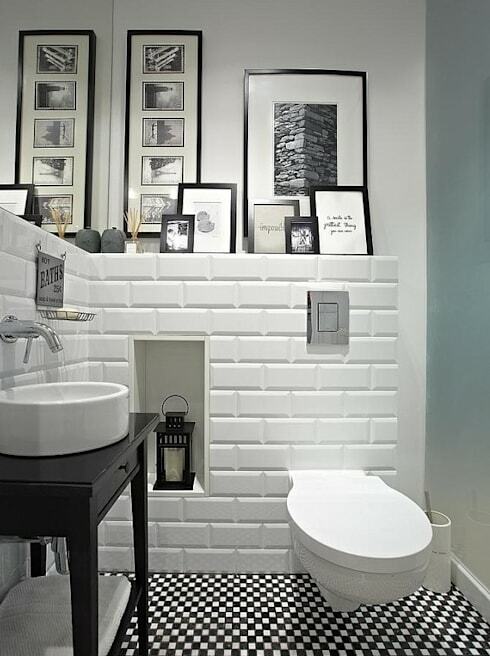 Monochrome white and black powder rooms are chic. Thanks for taking a look at our list for powder room inspiration! We hope that you came away with some new ideas for the everyday powder room. For more design inspiration, check out our feature on awesome guest rooms for your home.